We then moved on to today's lesson - we're reviewing prime and composite numbers. We completed a math journal entry on them yesterday (check back on Sunday to see it), but have been discussing them throughout our current unit. 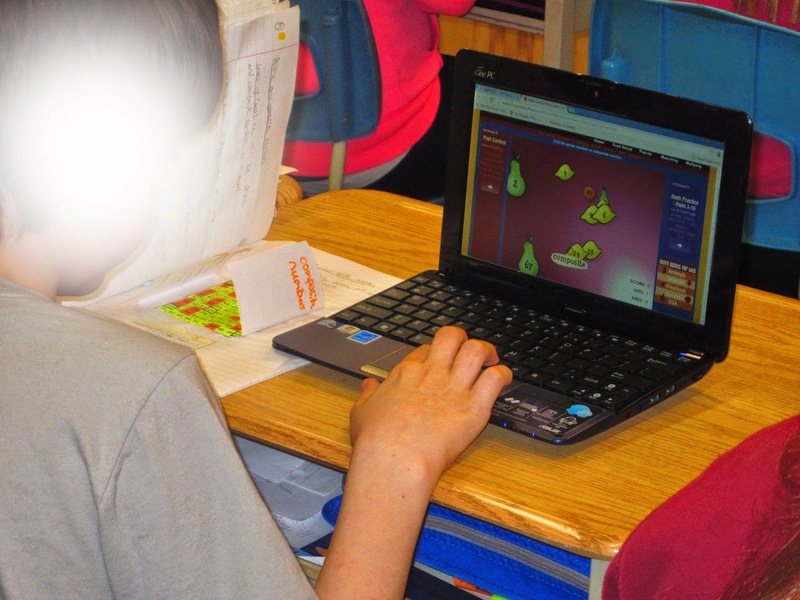 We then used our netbooks to play a fun game with prime and composite numbers - Fruit Shoot. They had a lot of fun with this one. You can see one of my students using his math journal to check his answers as he played the game. (Happy, happy teacher). Such a fun, fun lesson today - and that equals success in my books! Hi Jenn, I am loving your site and all of your ideas! I'm new to 6th grade after many years in primary and I am feeling very inspired by all of your cool ideas! Thanks so much for sharing! How long is your math block each day? Sounds like a great lesson! Sounds like a great lesson. I always enjoy teaching prime and composite and all the connections you can make with multiplication and division.